I was going to put this gorgeous cast iron cookbook stand in my garage sale this Fall 😯 , but now I am so excited to be able to give it away to one of you! I had this beauty on my counter for a couple years now, and I still really love it, but I’m trying to reduce the things on my island, and I usually look up recipes on my phone. I actually began sitting my husband’s iPad on it and it really worked great, but I still needed more room, so now it can be yours! This cast iron cookbook stand can be used for cookbooks (notice the long paper weights to hold down the pages), paper recipes/cards, or even an iPad, or phone if desired. It’s very high quality, and very heavy so it doesn’t tip over. I think I’m starting to miss it the more I write about it 😯 . *This giveaway is for US residents only and you must be 18 years of age or older to participate.Giveaway runs from March 14th through March 21st. Winner will be chosen randomly and notified by e-mail. 1. Share this giveaway by pinning the graphic below to Pinterest, or if you aren’t on Pinterest, please share with a friend by sending the link to them. 2. Leave 1 comment below. 3. Subscribe to redheadcandecorate.com HERE. 4. Don’t forget to visit all 11 blogs for their individually run giveaways (this is optional). Your chicken Loretta looks amazing! I can’t wait to try it for dinner this week!!! It not only appears tasty ?, but it seems to be so moist! I can’t stand chicken when it’s dry. Thank you for the recipe!! Love the video, especially that it was quick! I will have to try the recipe. Saw the video, made the Loretta Chicken, it was delicious! Thank you for being so kind & sharing another great give away! Love this cookbook stand. I am always spilling things on my cookbooks so this would be awesome to have in my kitchen! Love your website and looking forward to checking it out more! Hello! I just found you from Kristi/i should be mopping the floor. Your cooking video was great; it was well-edited and made the recipe look easy. 🙂 Now I’m off to look around your blog some more…! Looks yummy! I want to try it as my husband loves dark meat chicken best. The chicken dish looks wonderful! I am going to add it in to our meal delivery business rotation, and have my husband make it for our family next week! Great video! Your Chicken Loretta looks amazing. Best thing for me is it looks easy enough for me to try. Thanks for sharing it and for the chance to win that beautiful stand. My daughter gives me a calendar each year with monthly photos of my grandkids that would look great on it. Your recipe for Chicken Loretta looks amazing and I cant wait to try it!! I love the chance of winning the beautiful recipe book stand and know it will look as gorgeous in my kitchen as it did in yours!! Plus I promise to take good care of it!! It looks delicious AND easy. I like that you can add more or less of the spices to please everyone’s taste! Kudos to you for a video that’s quick yet clear. Oh Julie, thank you for this opportunity to win! I love your trivet and would love to see it on my counter. I enjoyed watching this video; it is precise, exact, easy and shows us just what to do! I know it is exactly how it will turn out because I have made this tasty recipe several times. My husband and I both agree it tastes great! I know when I prepare one of your recipes it’s going to be a keeper. I cannot believe that was your first video! It was done so well. The Chicken Loretta looks delicioius! Super tasty and moist! Nothing worse than dry chicken! Cannot wait to give it a try! The cookbook stand is gorgeous! Anyone would be thrilled to win it! Love your blog! Your recipe for Chicken Loretta looks delish. Pinned for dinner this weekend. Your wonderful giveaway of the cast iron cookbook holder would be the perfect holder in my kitchen to hold cookbooks and my iPad when I cook. Thank you! So what you need is a iron stand in cell phone size. Bet somewhere, someone makes one! The chicken recipe looks good. I guess the baking temperature is 350 (? ), it would also be nice if estimated baking time could be included. Looks yummy! The video doesn’t give all of the ingredients, measurements, and timing, however the printable paper version has all of that in there for you. Thanks, Carol! I made your Chicken Lorreta and it was wonderful! Thank you for posting this recipe. I pinned and watched the video thanks! The chicken would probably be good with pork chops too. I need that stand for a gift for my sister. You Rock, Red!!! I made your Chicken Loretta recently and the whole family flipped out! So moist and flavorful. Loved your quick video, showing step-by-step, just how easy to do. Thank you so much for a delicious & fool-proof, company-worthy chicken recipe. God Bless Aunt Loretta!! The recipe stand deserves a place of honor on my counter, holding my IPad, featuring–what else?–Chicken Loretta. 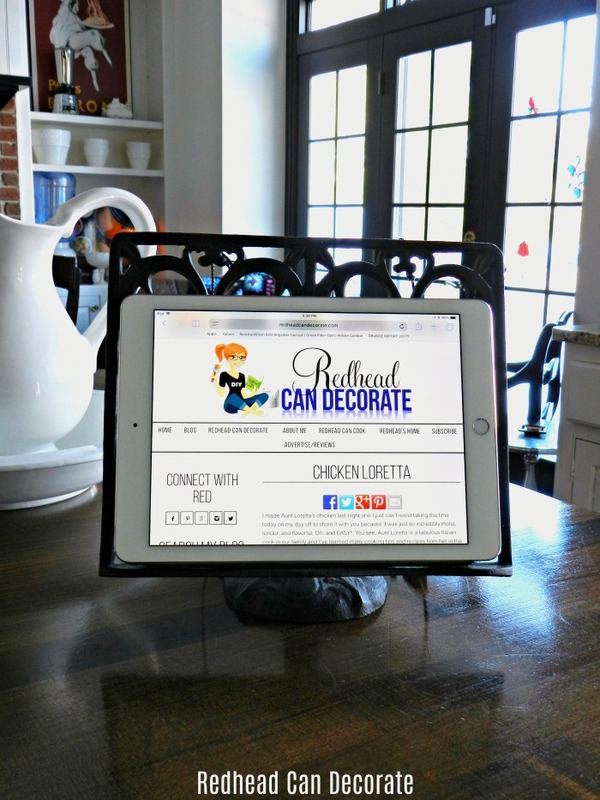 I appreciate the opportunity to visit your fellow bloggers, too, and the chance to win this beautiful stand. I don’t cook much, so I usually skip the recipes. But I think this one is one I can use, thank you. Love the book stand. I had a big party for our veterans to honor them for their services and made your Chicken Loretta and it was a great hit. Most of our veterans as you know live alone and do not cook much and when they tasted your recipe they were impressed on how easy it is to make, so I gave each one of them the recipe. There were a lot of them who told me that they will make it for themselves at home. So just want to alert you that you have a lot of fans who will be making this recipe and will be following your blog. Would love to win your cast iron stand. Your new avid follower along with the veterans. Thank you. WOW! You just made my day, Dorothy! Great giveaway and video recipe! You made me feel, “I can do this, Why didn’t I think of that.” I’m making it for dinner tonight! I loved the “Chicken Loretta” video. We are having it tonight. Your video was great! It showed how easy the recipe really is. Thank you so very much!!! wow julie! tried your recipe and it was fabulous! i too love the thigh of the chicken the best because it is so juicy and tender…i never would have thought to use mayonaise on it, but i guess that’s your secret ingredient…brilliant! i would love to have your book stand…i promise i will take good care of it…my kitchen has allot of black, so it will be the perfect finishing touch!!! Love the recipe, watched as much of the video as I could before it quit for some reason but looked simple to follow. I almost bought one of these book holders at a local flea market in our area. Plan to get it is it’s still there and if I don’t win this one. Thanks a bunch!! Yummy..with Husband coming home from surgery, this will be a great recipe to fix during his recuperation! Mmmmm… your chicken video looks good and I think I will cook it tonight! Love the video! I actually spotted the recipe on your site earlier and I’ve made it at least 3 times now. We love it, it’s quick, easy, and oh so good!! Thanks for posting it! This is beautiful. I would love to have it for my kitchen. Nice video … Will try the easy looking recipe for sure! Love the cast iron stand. Been meaning to make me a Kindle stand, but haven’t done it yet…would be great not to have to! Love the simplicity of the ingredients and the fabulous finished product! Always great to get new recipes thank you! Tried quite a few of your recipes and love them all! I love this recipe so much. Just wish my husband liked chicken so I could make it more often. Loved the video, showed how easy it is to make! Oh, I could so use this cookbook stand when I am in the kitchen cooking. Love it! I shared on Facebook. The video shows me just how easy and quick this is to make. I have to be gluten-free, could I just skip the gluten and just use mayo and spices? Thanks for the recipe and video! I haven’t made it just yet, but it is on my Pinterest list of “Things To Try”! The best recipes are those that have been handed down and tried and tested! That looked good enough to make my 12 yr old vegetarian give great consideration to granting herself one last taste before a forever goodbye! I’d hate to be the cause of my daughter giving up on her newly dedicated diet, but a little renegotiating for PROTEINS sake wouldnt keep me up at night! So trying to eat healthy is not always easy; however, when one partner has diabetes and one heart disease you start looking for better recipes. I thought I had tried them all. Let’s face it you can only serve chickens so many ways your’s turned out great, even more important tasted great and was not too difficlt. Now i think I should be the big winner of the cookbook stand. It would look marvelous in my kitchen and in addition to that i would really use it. lost count of how many cookbooks I have. Thank you so much. Thanks for sharing the chicken recipe. Can’t wait to try it! Made the delicious chicken recipe but used breast and served over brown rice with roasted Brussels sprouts. The chicken was delicious and moist even using breast. Love the cookbook stand as I keep a cookbook out just for “pretty.” The rod iron would look great with my few McKenzie child’s pieces!! Oh my goodness. That looks amazing. Your first video??? Off to a great start, can’t wait to see more. Thank you so much the chance and good luck everyone on this fabulous gift. Thanks Julia, your Chicken looks mouthwatering. You are so sweet to be giving so many wonderful giveaways at one time. You are rocking . You did such an excellent job on the Chicken Loretta video. Why it looks professional, as if you were a pro yourself on a cooking show! ? It looks delicious and easy to make. I can’t wait to try it. It looks so good and easy! Love the cookbook stand! Your recipe sounds delicious. I’ll have to give it a try. I LOVE this stand!! I think it would look AWESOME w/ the Family Bible on it!! I ‘Pinned” & shared on FB. That Chicken Loretta recipe looks SO yummy & moist! Thank you for this giveaway & the YUMMY recipe. Thought the video for “Chicken Loretta” was awesome! Looks easy and delicious! I made the chicken Loretta when I saw it posted on your page. Then I saw the video. Then I made it again. I’ve nade it twice, it’s very good and so easy!!! The video was quick, clear and made the dish look so tempting that I made it last night! Easy and Yummy – thanks and keep them coming! 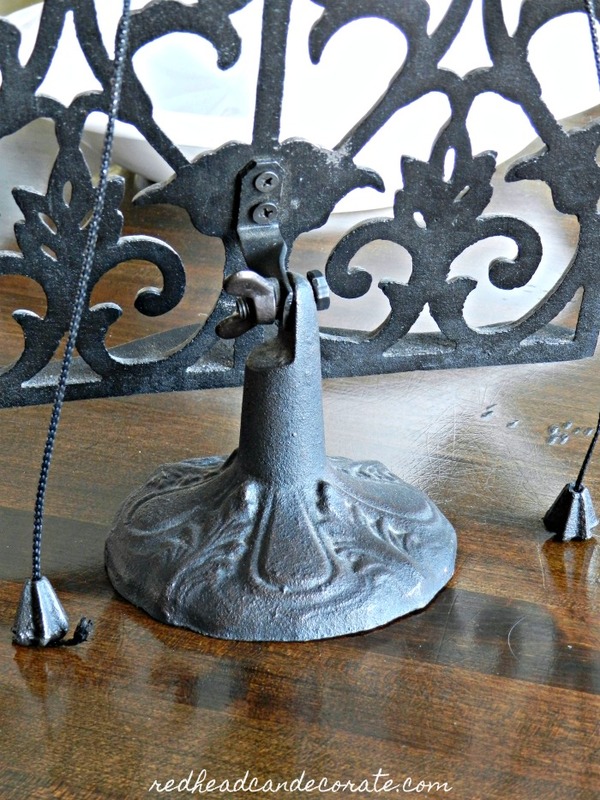 I was thinking of making an ipad stand for the kitchen — love this cast iron version! Chicken thighs… so underrated! Enjoyed this recipe. Thanks for the chicken recipe. Quick and simple but delish. This was my first time on your site. I will be back to visit again. It gets my thumbs up. Thanks again. This recipe is the bomb! Since I am on weight watchers I substituted breasts for the thighs and it fit perfectly into my plan! ? 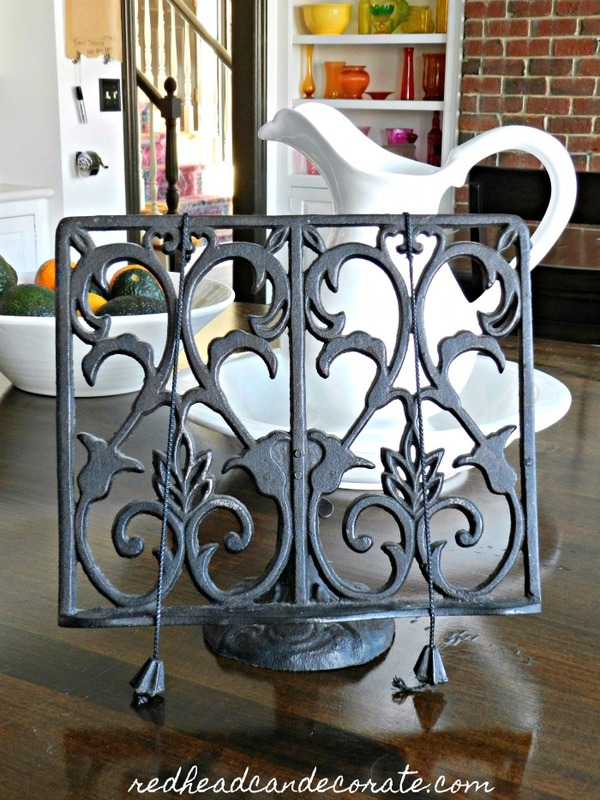 I gotta admit, I’ve never seen a cast iron cookbook stand before – it’s gorgeous! This is a great recipe; so easy to prepare and my family loved it. Your chicken recipe looks delish, and your video was awesome, well done! I really love your giveaway cookbook/IPad holder too, its very generous of you. Thank you for the opportunity! I will share on FB and Pintrest. Thanks, Julie for sharing your delicious chicken recipe. My hubby LOVES him some chicken. You are going to have such a lucky winner for your cookbook stand. Good luck on the giveaway and have a wonderful family weekend. I can’t wait to try Chicken Loretta! I use my phone for recipes constantly and would love your beautiful stand! I pinned as directed and watched the video which made me hungry and regretting that I didn’t have any chicken in the house! ? So I will be trying the chicken recipe soon, I appreciated that the video is short and to the point. I will be back to look around your blog and possibly subscribe. I prefer to check out blogs before subscribing to make sure it is something I will really enjoy. Thank you for this opportunity, I am absolutely in love with this wrought iron cookbook stand. I pinned. And, yes, I’ll take some chicken, please. I’d love this cookbook stand. I loved your video! It was easy to follow with the video and the text. I really like how it was quick and to the point. Thank you for the awesome giveaway! I have always wanted a cookbook stand and would love to win this one! Chicken Loretta looks good! I love a recipe that can be adapted to different tastes (the oregano would be a big NO for several family members). This giveaway was a fab idea! Thank you for all that you do for us! Thank you, Vicki! It was so fun!! I collect cast iron since my mom died. I inherited hers and my grandmothers. I am now in love with anything CI! I’ve never tried Chicken Loretta, but the video made it look juicy and delicious. Cant’t wait to try out the recipe and hope I’m lucky enough to win the recipe holder!! Interesting recipe, I’m not sure about the mayonnaise though. I like the video. I wish I could speed cook! BTW, that cookbook holder looks amazing and I would love to have that in my kitchen. Jane-there is a printable recipe available next to the video. The mayonnaise seals the chicken, helps give a crispy coating, and gives amazing flavor. Hundreds have tried it. I hope you do, too! Great video, nice and quick, Will definitely be trying this recipe! And the cookbook stand would display a picture sitting atop my antique dresser! Love the chicken video going to have to try that recipe , made me hungry , and i love that recipe stand , ty for posting the video. Looks quick and delicious. Yum! Looks quick and delicious – my kind of recipe! I loved the video! I also pinned the recipe to try this week. Thank you so much for sharing such a wonderful recipe and giveaway. Neat, I was thinking tablet holder too! The chicken dish looks delicious and easy to prepare. One pan, yeah. Also like that the video and recipe are given without first writing a book about it. Some blogs headline a recipe and then blah blah blah about the. I want to read a recipe first so I can decide I am interested and then I can read all about how good it is. I agree, Rebecca! Less talk, more food on the recipe posts for sure!! ? Oh my goodness!!! That is so awesome!!! What type of tofu do you use? I have a vegetarian son! The mayonnaise is an good way to keep the chicken from drying out. We do a similar coated with Dijon mustard. I am definitely trying this one! The recipe looks easy and tasty! I’d love to have the cookbook stand. I liked the video, easy to follow but would also need to printed recipe too. Love this giveaway and your Chicken Loretta is on my “To Make” list! Great video; quick but thorough. Hello! Just want to say first I’m glad I came across your site! The Chicken Loretta looks delicious! I love video recipes! I’ve been looking for some new chicken recipes and I’m going to try this one this week for sure !! I shared the giveaway on Pinterest and FB 🙂 going to sign up for your newsletter and follow your social media sites, thanks for chance to win the gorgeous cast iron cookbook stand . What an awesome idea to use as iPad holder ! Hope I can win it to use for my iPad ! Love the look of that recipe book holder….and love how the ipad is on it. Your recipe looks so good and super easy. Definitely pinning to make later. Great vide. I thought that the video was really nice. I have heavy cookbooks, so this would come in handy.